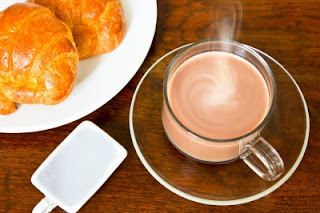 Travel-Tot: Tip of the Week: Jazz Up Your Hot Cocoa! Tip of the Week: Jazz Up Your Hot Cocoa! What's better than family time frolicking in the snow? How about warming back up with a nice big mug of hot cocoa; and not just any old hot cocoa - why not make it special with these fun, family-friendly ideas! Looking for something a little different? Add a spoonful of Nutella to your cup of hot cocoa and stir to dissolve completely - the flavor is simply heavenly! Another fantastic idea; substitute almond milk for your usual milk or water! Build a little "toppings bar" for your culinary artists! Some fun toppings that top our list: mini marshmallows, peppermint sprinkles, whipped cream, cinnamon sticks, candy cane stirrers, chocolate shavings, and small cookies for dipping! Flavored syrups like peppermint, raspberry and orange also go famously with hot chocolate! Leave 'em smiling with fun touches like peppermint marshmallows, crushed candy toppings, or glasses rimmed with crushed peppermint, crushed graham crackers, or crushed ginger snaps! Shout Out of the Week: Become A Nanny! 4 Great Free Edu-taining Game Sites! Tip of the Week: Share the Love!